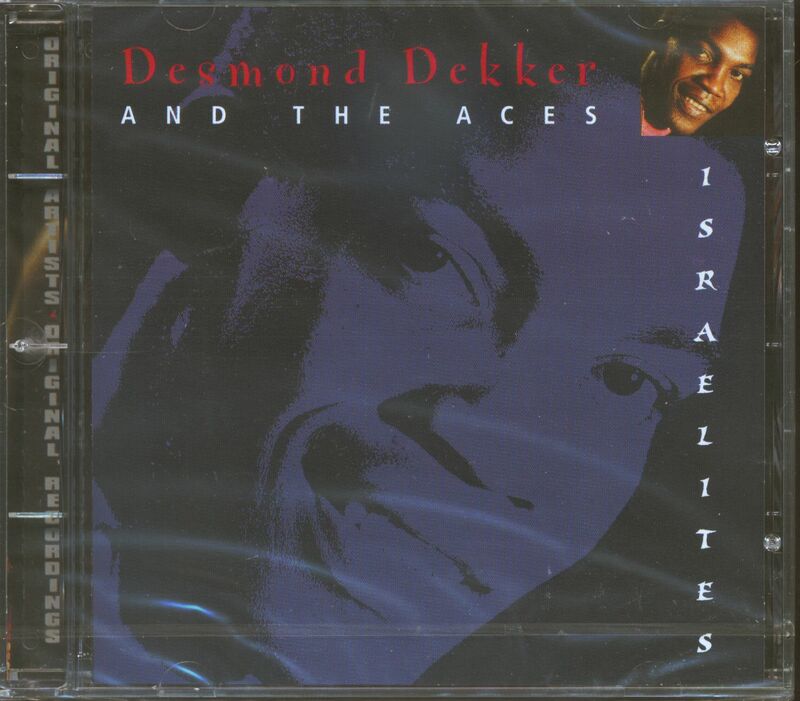 "Desmond Dekker & The Aces"
This is Desmond Dekker, the no. 1 'hepcat', the ace 'sure shot', the man who put the reggae sound firmly into the U.K. charts in 1967 with '007 (Shanty Town)' and two years later gave reggae music two first time ever achievements with 'Israelites' — the no. 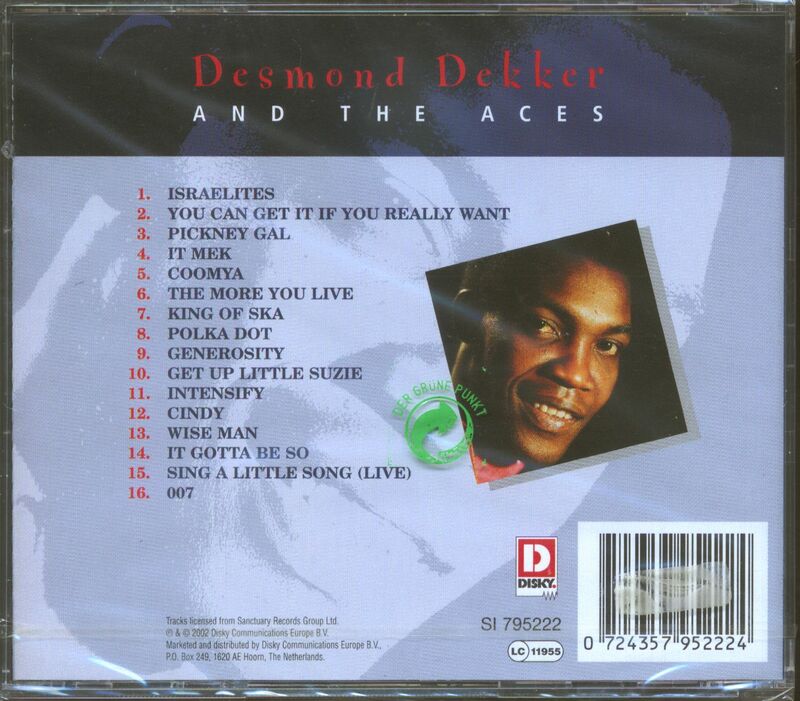 1 chart position in the U.K. and a chart entry in the U.S.A. Long before Bob Marley and The Wailers had made any sort of impact in the U.K. there was Desmond Dekker and the Aces. The kids in the dance halls and clubs who were dancing to the sounds of soul and Motown had a new dance music, pop music lovers of all ages had a new kind of pop music and the skinheads, that were soon to come, made the music theirs and the songs their anthems. The floodgates to Britain had been truly opened and the music of Jamaica flowed in. Back in Jamaica Desmond was already a star, albeit not yet in the league of say Alton Ellis or Derrick Harriot. Born in Trenchtown, Kingston in 1943, it was in late '62 early '63 that he cut his first record, the song was 'Honour Your Mother And Father', the producer, the now legendary Leslie Kong. The Chinese Jamaican Kong was to become reggae's most successful and prolific producer of the late '60's and early '70's. He created a distinctive and instantly recognisable sound that was both commercial and great to dance to. It was a sound that travelled well. U.K. chart hits for reggae newcomers Jimmy Cliff, The Pioneers and The Maytals, to name but three, were all Kong productions, his first chart success though was with Desmond Dekker. Kong's early work with Desmond (the earliest example of that work here being 'Get Up Edina' from April '65) produced a whole clutch of records, each with varying degrees of local success. In those days Desmond's band were credited as 'The Four Aces' and on one occasion 'His Cherry Pies' for the song 'King Of Ska', released also around 1965. By the time of his U.K. breakthrough they had the name that was perfectly apt — The Aces. Listen (especially on side 1) and you'll see what I mean. Their contribution to the unique sound created was immeasurable. What was also immeasurable was the importance of the artist/producer relationship that had developed over the years. Kong had become much more than just Desmond's producer, he was also his Mentor and Guardian. The hit singles continued as did this special partnership, until it ended rather suddenly in 1971, when Kong died of a heart attack at the age of 38 — the effect of this loss on Desmond was shattering. Here then, at long last, is an album that truly does justice to the legend that is Desmond Dekker. The music is ska, rock-steady and reggae, the songs, with the exception of one, were all penned by the man himself. Customer evaluation for "Israelites (CD)"